← IT Transformation – What do you want? What’s all this about VSPEX? If you missed the announcement, please have a look here for the announcement video. Ok, that’s awesome! Giving us more choices, more simplicity, and more efficiency. But what’s in it? And how does it work? 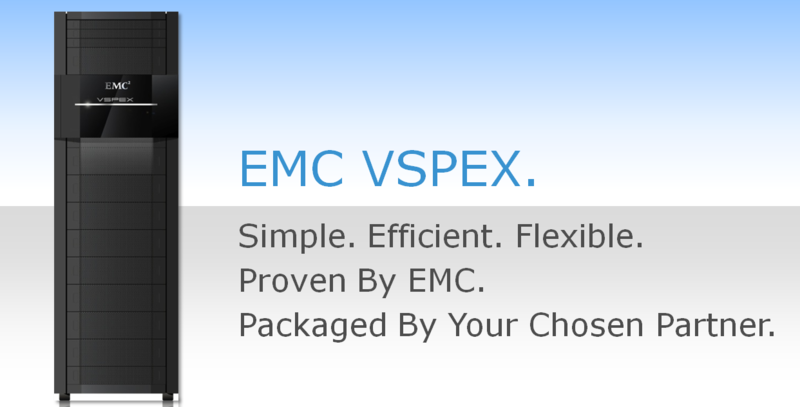 EMC VSPEX is a fully Proven Infrastructure Solution that gives you, the customer, a choice of what you need to fully build Private Clouds, Virtual Desktop Environments and more. This is made possible by a broad Alliance Partnership with great partners such as VMware, Microsoft, Cisco, Brocade, Citrix and Intel. This means that you will have Proven Solutions from these partners regarding a variety of solutions, such as both VMware and Microsoft Private Clouds, or VDI using either VMware or Citrix as your favourite VDI vendor. Many customers that I’ve met lately are looking to deploy virtual infrastructures but are not yet ready to standardize on a fully converged infrastructure. With VSPEX, customers are offered a way to expedite time to value by working with channel partners to deploy proven and pre-validated solutions while preserving the flexibility to pick the right components for their infrastructure. Maybe you think this sounds a bit like a Reference Architecture? Well, not really. VSPEX takes the customer experience of deploying Reference Architectures to a new level by offering pre-validated solutions delivered by partners that are easy to consume by customers. Customers that usually consider leveraging Reference Architectures do so because of the possibility to gain the flexibility to pick and choose the best of breed components. However, in doing so, they give up the simplicity of the solution. With VSPEX, EMC is delivering proven infrastructures that deliver the benefit of ease of deployment while maintaining choice for customers. They’re simple, efficient, flexible, and pre-validated. VSPEX takes time and cost out of deploying data center infrastructure while increasing service levels through their proven performance. So, what’s left to say about the VSPEX? Well, call your local partner or EMC representative and have discussion regarding how EMC and the great partner alliance around the VSPEX can help you in achieving a faster, better virtual infrastructure for your Private Cloud needs. This entry was posted in EMC, VSPEX. Bookmark the permalink.